I was making ice cream last night using the custard method. Custard method means I'm going to need some egg yolks, 5 egg yolks to be exact. So I took the carton of eggs out of the fridge, a carton of large, cage free, vegetarian feed, brown eggs from Trader Joe's. I selected an egg to crack open so I could separate the yolk from the white and discard the white. But when I pulled apart the egg shell, something quite unusual, VERY cool, was staring at me in the face! 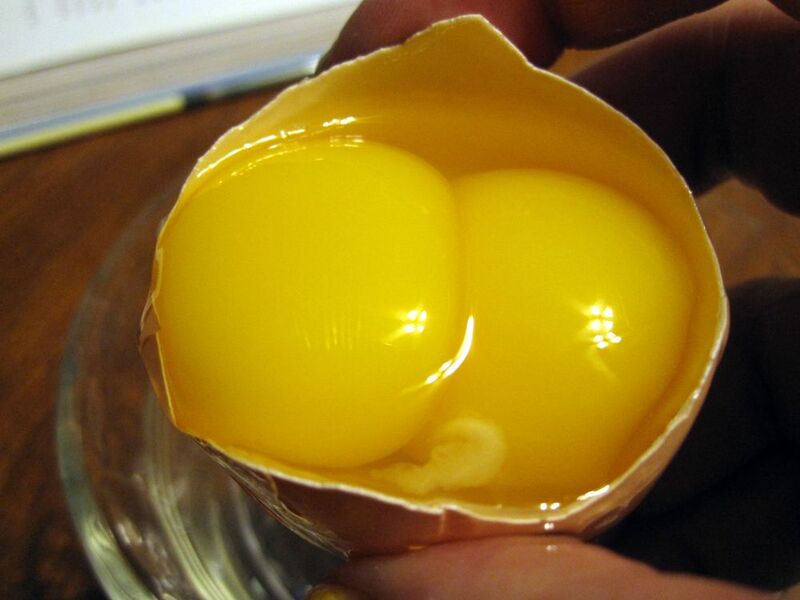 Not one, but two egg yolks! In a single egg! What? Yes! 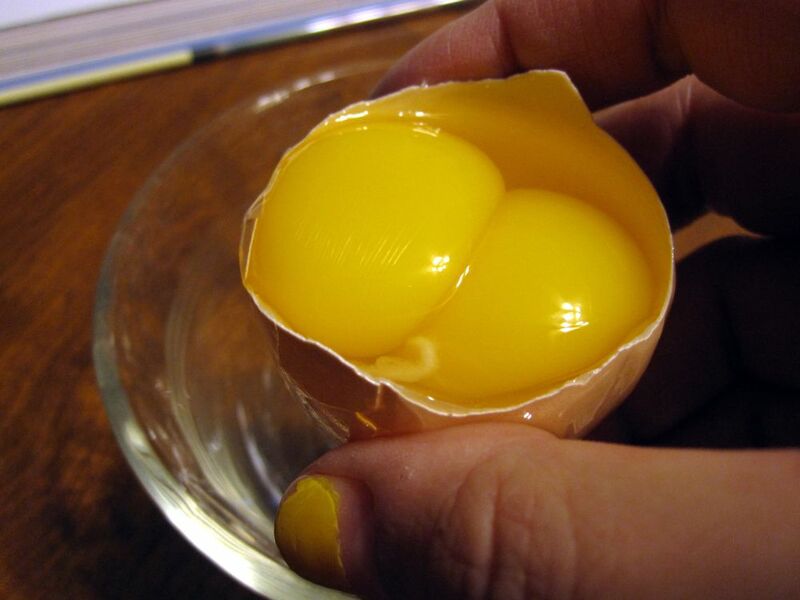 Two egg yolks were inside one egg! I was in shock. Giddy. I felt present at a school science experiment or bizarre egg research study in a government-run food science laboratory. But no, it's just me in my kitchen, using friendly Trader Joe's eggs. Huh. 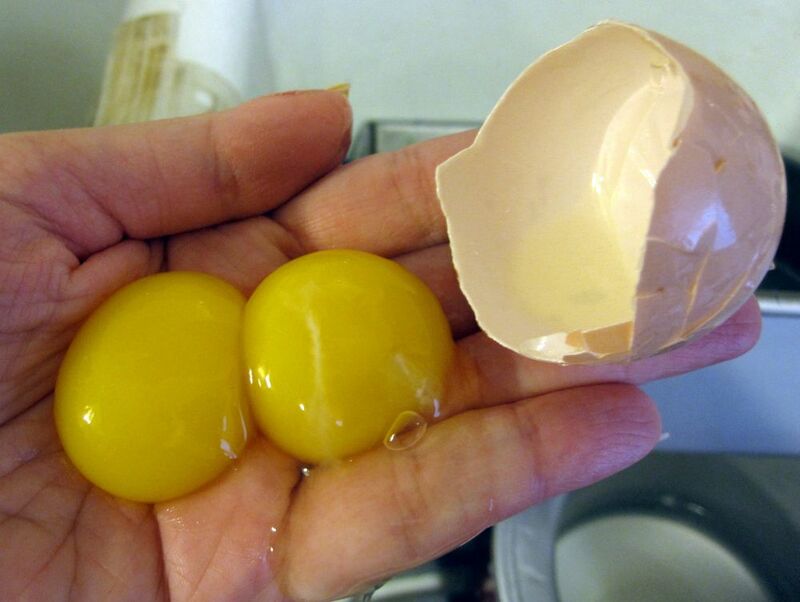 So I poured the contents of the shell into my hand, allowed the egg white to fall through the cracks of my fingers, and stared dumbfounded at two egg yolks sitting in my hand. They were connected! They were not just twins. They were conjoined twins! Siamese if you please? I put them in my large glass bowl, moved the bowl around, and watched as the two yolks slid across the bottom of the bowl TOGETHER, connected at the hip, if you will. I'm clearly not over the shock. Haha! But back to the project at hand. 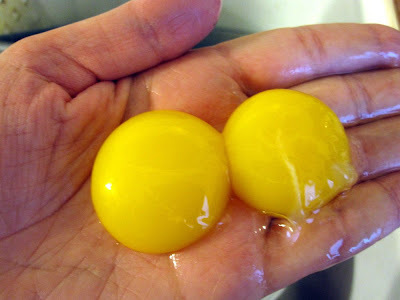 I still needed three more egg yolks for my ice cream! 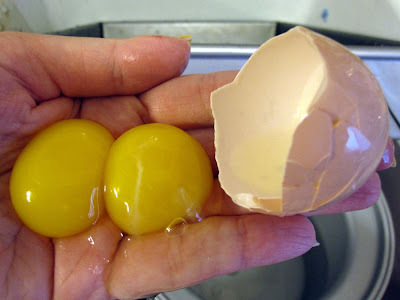 I was even more dumbfounded to find two more yolks in a single egg! It was happening again! OMG! Let's review the stats so far. I need 5 egg yolks for this ice cream recipe. I have four egg yolks. As it turns out, when I cracked my third egg, the results were more normal, and I got only one yolk inside that egg. But hey, five yolks in three eggs is pretty impressive stuff. Is the moral of the story that everyone should buy their eggs from Trader Joe's so they can get more bang for their buck? I mean, I only needed to crack three eggs, not five, to get my five yolks for the ice cream recipe! Saved me a few pennies. Or maybe this happens to everyone now and then? Doubt it. I can tell you this. I'm a baker. I've cracked hundreds and hundreds of eggs in my lifetime. This has never happened to me before. It may never happen to me again. But it just happened to me twice in a row! I'm going to buy a lottery ticket. EGG-SCLUSIVE MYSTERY EGG VIDEO DIARY!!! Marni, Let me be the first (at least with regard to this blog post) to say you are hilarious!!! You sure looked like you had a great time in the kitchen tonight!! I am so glad you let us in on your fun! I've seen "twin" eggs before, but not one right after the other. It must have been your lucky day. BTW, how did the ice cream turn out? I wonder if they were from the same chicken. Maybe they were from a very fertile hen.